You and your sweetie swap “I do’s” and kiss—your first as a married couple—as the sun shines down on you, your friends and your family. Hold up. What if it’s raining? Or so humid that your makeup is dripping off your face? Wisconsin’s finicky climate might threaten to wreck your special day. But fear not—these tips from wedding planners who have braved the elements to pull off the perfect day will show you how to deal with an uncooperative weather report. If it’s raining, just move the wedding inside, right? Um, not really. What if you can’t find an available venue—or the venue connected to the outdoor area is already booked? “A back-up plan really gives brides peace of mind,” says Andrea Benrud, owner of ablush weddings & events in Appleton. “Hopefully you don’t have to use it, but it’s there” if you do. Kuehnel says brides shouldn’t think twice about adding a floor under a tent; this is not the time to pinch pennies. If it does rain, the grass will be a mess of puddles and water leakage, she says, and even if it’s dry, women’s heels can get stuck in the softened dirt. Go up a tent size larger than you think you need, says Andrea VandeBerg of Cherry Blossom Events in Madison, “to function on multiple levels.” At the very last minute you might have to walk down the aisle under the tent. With any tent order you can add heaters, walls or doors a few days prior, says Benrud. “A lot of tent companies understand that weather is unpredictable,” says Kirstie Warren, co-owner of Elevate Events in Madison. Even if thunder’s rumbling in the distance, don’t fret if you feel a few sprinkles. Umbrellas can be incorporated as a design element. At a garden wedding, recalls Mallory Wedel, co-owner of Elevate Events, it started drizzling. Guests grabbed umbrellas—all of them transparent, rather than a contrasting mix of dark ones, so the photos still looked great. “It made for a really romantic vibe,” she says. Kuehnel swears by the Dark Sky Weather app, which approximates rainfall down to the minute; she has seen many weddings rescued thanks to the information. Not only can you delay or push up the start time, you can flip events so that, for example, cocktail hour is before the outdoor ceremony (as long as you don’t mind the groom seeing you in your dress!). 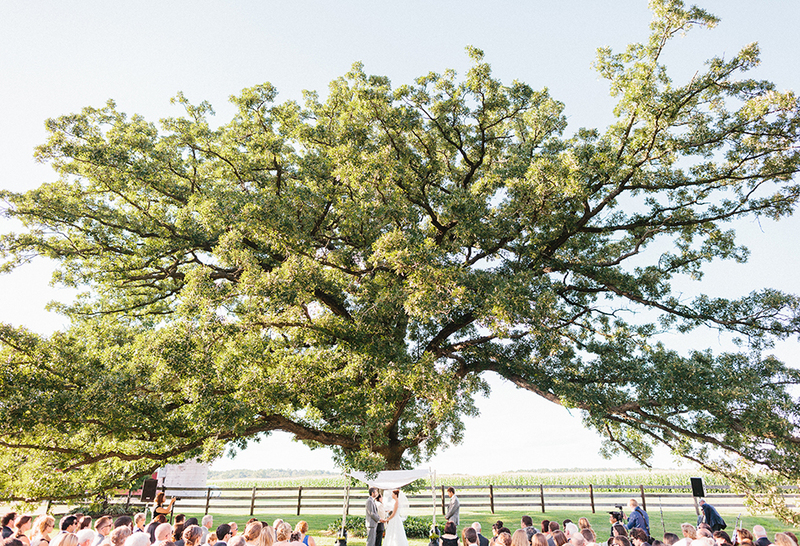 At an outdoor site, don’t stress too hard about where you’ll “walk down the aisle.” “Find a big gorgeous tree or a focal point for the ceremony and build around that,” says VandeBerg. One of Kuehnel’s favorite Wisconsin venues for outdoor weddings is Whistling Straits in Kohler, where you always have the lake and the hills as your backdrop, she says. Ask your florist to weight plants with rocks or crystals so they don’t fall or get blown over, advises Warren, or invest in heavy planters. Cozy blankets in a basket can double as wedding favors. Add a sign that invites each guest to use the blankets in the evening and take home for later. You set up a wedding website for a reason—use it. A few days before the wedding, add contingency plans. Guests clicking around your venue’s address will appreciate this. Adding tips about the kind of clothing and shoes to wear for comfort now that the forecast is more definite is a huge help, says Kuehnel. 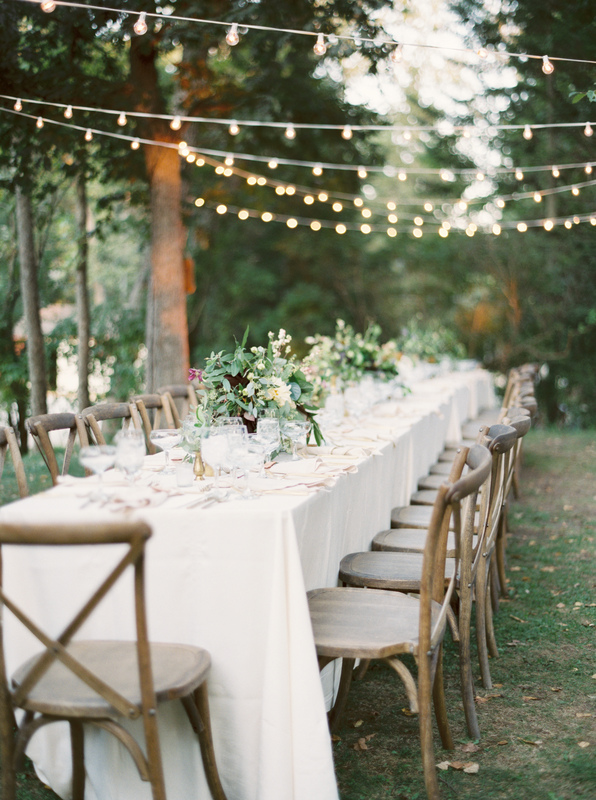 If it’s a lake wedding, VandeBerg suggests luminaries on the lake for a soft glow at night. To deal with high winds, invest in agate coasters or potted succulents, says Warren. “It’s one way to avoid all of these paper goods flying off into the lake or the woods,” she says. At one wedding, Elevate Events created a cigar bar by stringing lights between trees. Especially if your wedding is in July or August, you may have unwanted guests. “Talk to a pest management company and have the area sprayed for bugs,” says VandeBerg, who advises setting up a table stocked with bug spray, sunscreen, paper fans and heel guards (for women’s heels). That elusive fourth season (hello, winter!) entices some brides with its snowy landscapes and cool, crisp air. But what if the temperature outdoors dips below zero and pristine snow turns to gray mounds? Or guests are delayed due to weather? Elevate Events has coordinated many memorable winter ceremonies. With a little thought, you can nail a comfy vibe. Weave candlelight and evergreens into your decorations, says Warren, “to embrace the winter and make it cozy.” Faux-fur shrugs for not only the bride, but also the bridal party, make great gifts and take group photos into winter-wonderland territory. If you’re worried about a white-out, the bride can wear white and the bridal party another hue, like dusty rose, heather gray or champagne. For photos of the happy couple, hand-thrown pottery mugs filled with steaming hot chocolate create instant allure.